Vaasthu based plans are available according to customers needs. The Place where a person lives and performs work called Vastu. 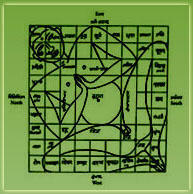 According to Indian ancient classical texts Vastu means appropriate land for house. All types of houses, buildings, cities, forts, bungalow industries where ever a person lives or works called Vastu . Vastu in Sanskrit means nature , a surrounding or environment. The word "vastuu" came from Vasthu, denoting anything existing such as house, shelter building etc. Shastra in sanskrit means systems. Vastu shastra is an ancient art and science containing principles and practices of constructing buildings which ensures a harmonious balance between man and nature and thereby bring all round happiness, health, wealth and prosperity. Vastu Shastra ( knowledge) This knowledge tell us about the land and building where a person resides or works gives maximum safety and convenience and gives provisions and methods to get maximum safety and convenience. It also enables the five elements of nature i.e. Earth, Water, Fire, Air. Space with natural forces magnetic, gravitational and solar power, and use, manage the life with all concerned activities to make them maximum result oriented with comfortable safety. Ancient sages of India laid down several principles for constructing buildings taking advantage of the nature, the Pancha Bhootas namely Earth, Space, Air, Fire and water. Gravitational and magnetic effects and rotational influences of Sun, Moon, Earth and other planets on the life in Earth with a view to bring balance and harmony between man, nature and his buildings and thereby ensuring peace, prosperity and happiness. These principles, called Vastu Shastra, were evolved over thousands of years out of experience and foresight of ancient Sages of India and are very valuable for the well being of man-kind. According to Shastras, if we worship, revere and respect the lords of these eight directions, they will shower on us their blessings and benefits. FINE ENGINEERS & ARCHITECTS is a professional consultancy and contracting organization offering total architectural, structural and project management services for Institutional, Commercial, Hospitals, Industrial, Residential, Hotels, Resorts etc. Founded and run by a team of qualified, experienced and deeply motivated professionals, FINE ENGINEERS & ARCHITECTS can boast of a track record of involvement in this particular field since 1997.